The Glen Forrest Community Garden began in 2008 with a small group of local residents creating a vision of establishing a community garden in Glen Forrest where everyone could come and grow all kinds of flowers, fruit and vegetables, in a fun, permaculture-inspired kind of way. The vision continues to develop and the garden is now growing in leaps and bounds. We meet on site on Sunday mornings from about 8:30am in summer 9:30am in winter for planting, harvesting, watering, mulching, chatting, planning and dreaming. Please come and join us – everyone welcome. See map below. If you would like to become a member please check out our membership page. We are very grateful to the Mundaring shire and local businesses who have supported us in various ways. Please check out our supporters page and in turn support these businesses with your custom. 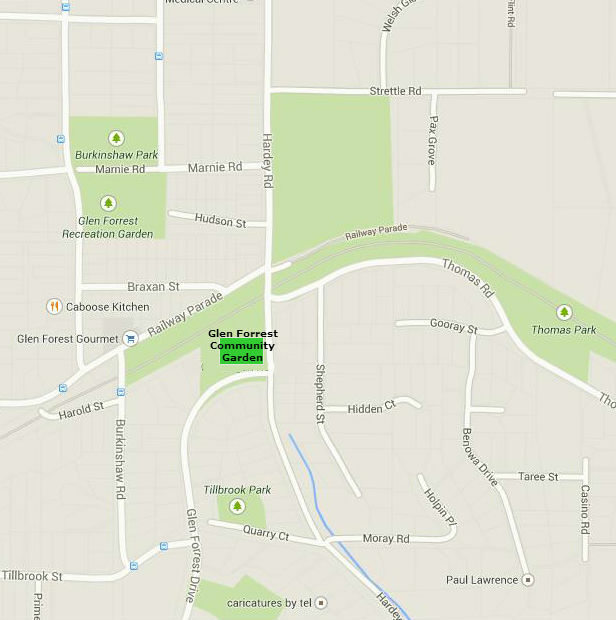 We were incorporated as an association – Glen Forrest Community Garden Inc. – in January 2013 and signed a lease with the Shire of Mundaring in October 2013 for 1000sqm of land at the corner of Hardey Rd and Glen Forrest Drive in Glen Forrest. If you are interested, have a look at some of our history. The map below shows where we are.